Rick Steves was here, took pictures and notes, was photographed with the owners, then left. We came, did the same, but stayed. Cretaiole is a Tuscan farmhouse a few miles from Pienza, a smaller town compared to the size of Thomasville.. We spent a week there, Saturday to Saturday, the first full week of our Italian three-week vacation in June of 2011. With our rented vehicle, we drove the country-farm roads visiting historic and famous hill towns of Tuscany, breathing it in, taking it in, experiencing it. Cretaiole is an agriturismo, an ancient Tuscan farmhouse, dating back to the 1400s, converted into guest rooms and apartments, featuring private entrances, small equipped kitchens, private baths, terracotta floors, beamed ceilings, a fireplace and the ever-present Bialetti Moka Espresso coffee brewer. (Which we acquired first thing after returning home). Outside is a fresh vegetable garden from which you have picking privileges. On your kitchen table are complimentary bottles of Orca DOC San Giovese homemade white wines plus a homemade bottle of olive oil. The farmhouse is high on a hill, so you can take your morning coffee or evening glass of wine, sit on the swing and enjoy the view of the Tuscan landscape. (World War II was fought here). See golden fields of grain, light green orchards of olive trees, bright green landscapes of grapes of the vine. It's the home of Brunello di Montalcino wines, vino Nobile di Montepulciano, bright green grassy tasting olive oil and Pecorino Pienza cheese, among some of the local delicacies. As you drive the countryside, and driving the countryside is a challenge, because there are no straight lines from point A to point B. In America, if road builders encounter a hill, they level it.. In Italy, if the landscape goes up a hill or dips below the hill, so goes the road. So you are constantly twisting and turning, going up or down, around and around, dipping and dodging. Behind you is the ever-present Italian driver, on your bumper, indicating you driving too slow. Also, on the farm roads, here's what you will NOT find: Fences designating individual farm sites, roadside trash, tumbledown shacks or shabby rundown houses, junk cars in the yards, weeds along the road edges, road shoulders. You will see homes and farm houses of similar construction, built with native adobe. Add the traditional tile roof. Isabella Moricciani is your hostess. She is fluent in English plus speaks other languages too. In your room, wander through a local thick guidebook that she has assembled. Whatever you want to do, where ever you want to go, it's all there including minute directions there and back. Isabella and her husband Carlo along with her father-in-law, Luciano, manage their farm in Pienza, Cretaiole, and a villa in Castelmuzio. Sunday morning finds you and other guests at the family farmhouse in Pienza, where Isabella lectures on local history while Luciano pours their homemade wines, carves pecorino cheese, with slices of homemade Italian sausage and aged prosciutto ham on hard crusted Italian bread drizzled with their farmhouse olive oil..
Their home-made wine is the finest, making 500 bottles a year for guests and sale – 5 euros. With your rental car and a place to stay, you are close to Siena, Florence, Pisa, Orvieto, Assisi, Perugia, Volterr, San Gimignana, to name a few. Easiest way to Cretaiole is to “google it.” You will get more than enough information. 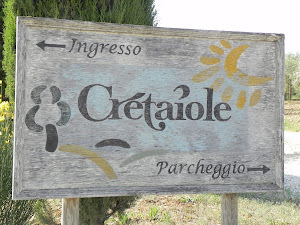 Address: Agriturismo Cretaiole, Via San Gregorio, 14—53026, Pienza (Siena), Italia. Please visit the website of my income; http://www.jamesellistonsmith.com/ Click to open the hyperlink then click the hyperlink to the website. Thanks for visiting. Welcome to our trip involving three weeks in Italy, June, 2011 with my wife, daughter and granddaughter. This blog will consist of many chapters as we spend a week here in Cretaiole, the days each in Florence, Rome and Venice. New chapters will be added on Tuesdays and Fridays. If you miss one, search archive. Are you involved with non-profit organizations needing money? If so, please visit my website detailing the joys of World's Finest Chocolate fundraising plus programs from American Fundraisers. Even if you have no interest, go to the pages anyway and enjoy the delicious photos.